Google The most widely used search engine is improving itself every moment. Google indexes pages in order to make search better. Google Dorks Enable us to search with greater details and accuracy. Google Dorks lets you customize your search query to display a specific set of results. Suppose if you want to search within a site only that is you search for some specific thing in a specific site. Or if you want you result to contain a word in title. This is called Google Dork. Dorks are basically keywords used to search. Here is guide HOW TO USE GOOGLE DORK . inurl: Followed by the keyword. This searches for all the urls containing the word. 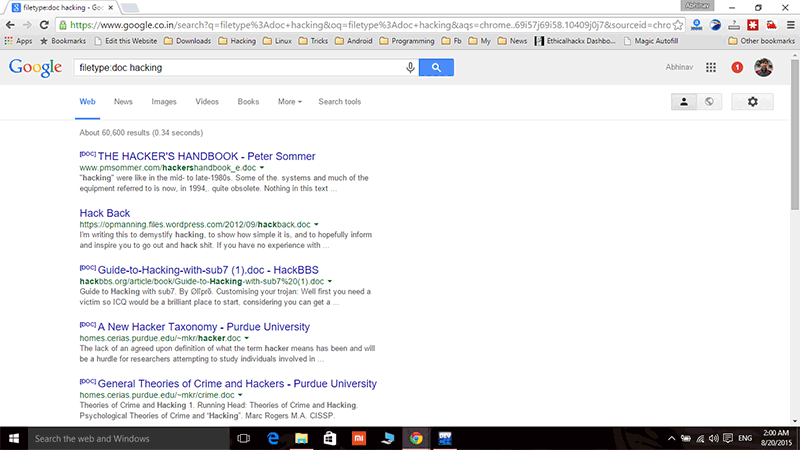 This one is largely used by hacker to search for sqli. This Dork is used to search for pages & websites that contain the specific word that you are searching. This searches for all the given words in a page or website. You can give more than one word , if you are looking for a result to contain all the words. This searches url containing the keywords specifies. This searches specific file type . Used to search a fixed date range. this is used to search within a site, The results come from a specified site. Example site:ethicalhackx displays all results only from ethicalhackx.com, site:ethicalhackx.com Linux This displays results from ethicalhackx.com word containing Linux. This display if the title of page, website has the specified word. 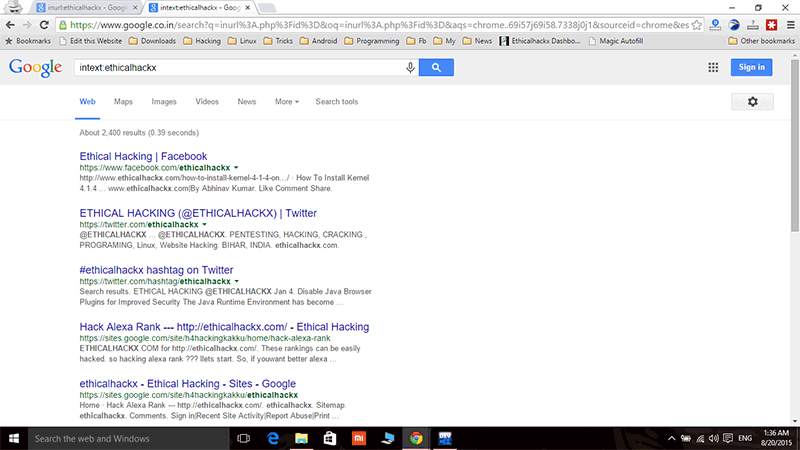 Example intitle:Hacking will display all results containing word hacking in title. intitle:hacking password . 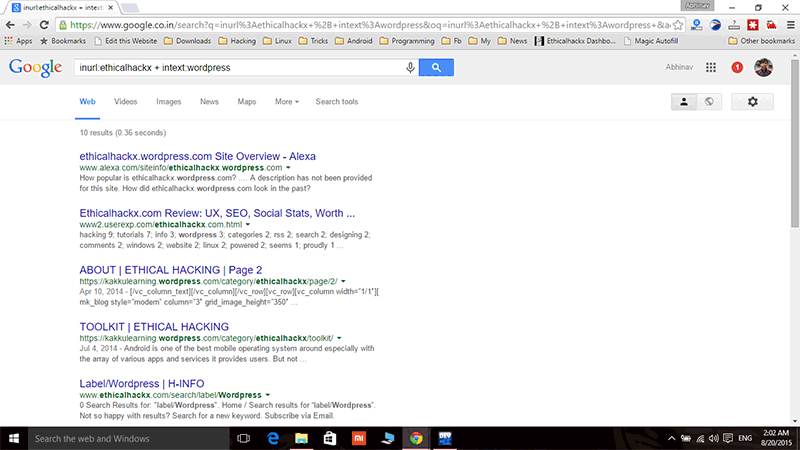 This will display results with word Hacking in title and keyword password in the page. This display results with all the keywords in title. 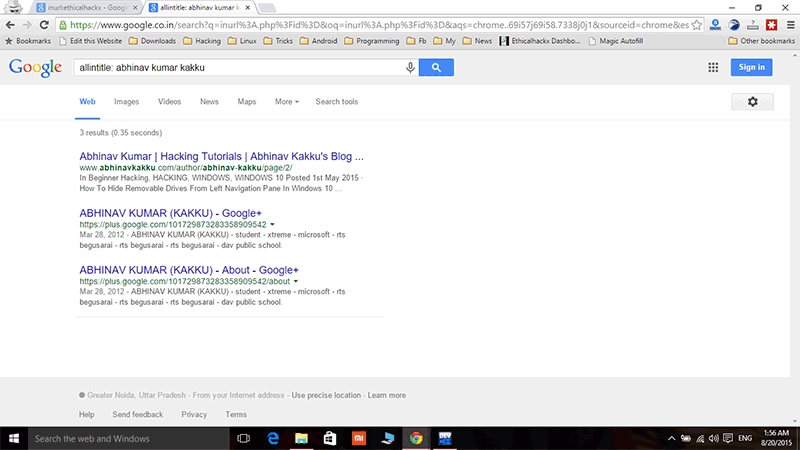 example allintitle: abhinav kumar kakku . This will display pages with titles having all three words. This is used to lookup for cached pages by google. You can join as many you like. Mishal Mahmood liked this on Facebook. Shyam Babu liked this on Facebook.